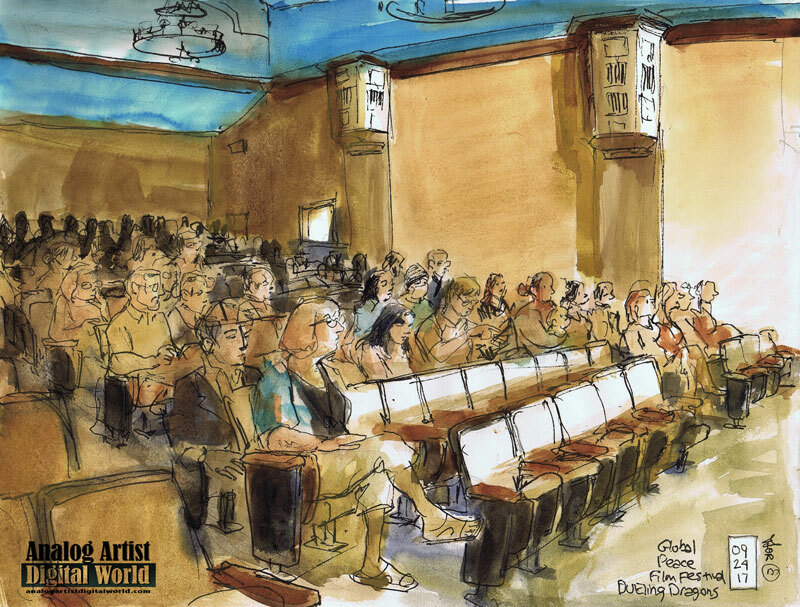 Analog Artist Digital World: Dueling Dragons at the Global Peace Film Festival. Dueling Dragons at the Global Peace Film Festival. I went to Rollins College to sketch a piano recital. As I walked past the Bush Auditorium, I heard my name shouted out. It was journalist Michael McLeod. He pointed out that it was the last day of the Global Peace Film Festival. He had just seen a film he loved called Accidental Courtesy, about Daryl Davis, a black musician, actor, author, and lecturer who befriends white supremacists and because of that friendship, they left the Ku Klux Klan. How can you hate someone you haven't met? Rather than sketch the recital, I decided to blindly see a film at the Global Peace Film Festival. The film about to screen was called Dueling Dragons. The Global Peace Film Festival, established in 2003, uses the power of the moving image to further the cause of peace on earth. From the outset, the GPFF envisioned “peace” not as the absence of conflict but as a framework for channeling, processing and resolving conflict through respectful and non-violent means. People of good faith have real differences that deserve to be discussed, debated and contested. The film festival works to connect expression – artistic, political, social and personal – to positive, respectful vehicles for action and change. The festival program is carefully curated to create a place for open dialogue, using the films as catalysts for change. Michael had told me that because of Hurricane Irma, the film festival has had very low attendance this year. I decided to sketch the close to empty theater but people kept arriving to populate my sketch. The theater probably became close to half full. I didn't have enough time to sketch everyone before the lights went out for the screening. The front row filled up with the musicians whose music was used in the film. Dueling Dragons directed by Brett Gerking runs 65 minutes. Orlando police officers and inner-city children form a dragon boat racing team and reveal their emotional journeys as the program grows. This ancient sport is rooted in Chinese culture, and is introduced at a critical time in the lives of both cops and kids in some of the city’s toughest neighborhoods. Success in dragon boating comes only when all 20 paddlers are in complete synchrony. Told from their straightforward perspectives, these cops and kids, they are transformed from wary participants to steadfast teammates. Along the way, they build trust and mutual respect, compete for gold medals and deal with the tragic loss of one of their mentors, Orlando Police Department Officer Lt. Debra Clayton. I had sketched a makeshift memorial for Debra at Walmart but seeing this film finally hit home for me how beautiful a person she was and how much of a loss her being shot in the line of duty was. She appeared throughout the film, smiling and beaming her love and support for the youth who became a team and each time I saw her my heart sank, because I knew what was to come. Life is so short and precious. Don't waste a moment. The Orlando Dueling Dragons team is the only rowing team in the country that has police and youth working together. I am intent now to find a dueling dragons race and shout for their victory.